In December 1935, the Beech Aircraft Company of Wichita, Kansas began work on their second aircraft, the Model 18. Their first aircraft, the Model 17 Staggerwing biplane, designated GB and JB, q.v., in U.S. Navy (USN) service, had been introduced in 1932 and this new aircraft would be radically different in construction and design than its predecessor. The Model 18 was a twin-engined, all-metal, low-wing monoplane with retractable main landing gear; the tail wheel did not retract. The tail unit consisted on twin fins and rudders; the ailerons, flaps, rudders and elevators had welded steel-tube frames with fabric-covering. Accommodations were provided for pilot and co-pilot sitting side-by-side in the cockpit with dual controls and up to eight passengers could be accommodated in the cabin. Intended for small airline or corporate use, this transport was designed to have low operating cost, cabin comfort, safety comparable to larger airliners, and the ability to operate from small airfields. Unfortunately, the Model 18 had to compete with the Lockheed Model 12 Electra Junior, designated JO and R3O, q.v., in USN service, and the Model 18 was underpowered when compared to the Lockheed machine making it undesirable to U.S. airlines. Sales were limited to only 39 aircraft prior to 1 September 1939 including five aircraft purchased by three small Canadian airlines. Although not a great success initially, over 4,500 of these aircraft were acquired by the U.S. military during World War II. After the war, Beech continued to produce the Model 18 until 1957 with a total of 6,326 aircraft delivered. In 1954, the Super 18 was introduced and 762 were manufactured until the last Model 18 rolled off the assembly line in November 1969. Nine versions of the Model 18 were built powered by the five engines listed above. The second version of the Model 18 was the B18S, the B prefix indicating the second version and the S suffix indicating the powerplant. The only difference between the Model 18S and Model B18S were interior changes. In 1939, the U.S. Army Air Corps (USAAC), superseded by the U.S. Army Air Forces (USAAF) on 20 June 1941, ordered two versions of the Model B18S for military service. These two aircraft, like all Model 18s in U.S. military service, were powered by two 450 hp (336 kW) Pratt & Whitney R-985 Wasp Junior nine-cylinder, single-row, air-cooled, radial engines with Hamilton-Standard constant-speed propellers. The first order, placed in April 1939, was for fourteen specialized photographic reconnaissance aircraft, designated F-2; these aircraft had two multiple-lens mapping cameras located in the cabin floor and a special device installed in the cabin door permitting side-view or oblique-angle photography. In August 1939, eleven aircraft intended for use as six-passenger staff transports, designated C-45, were ordered. [In 1943, the USAAF redesignated transport and cargo aircraft that could accommodate up to eight persons, including pilot, or a cargo weighing no more than 1,400 pounds (635 kg) as utility transports and cargo aircraft (UC) and the C-45s were redesignated UC-45s.] In June 1940, the USN placed an initial order for five Model B18Ss similar to the USAAC's F-2 to be used as photographic and drone-control aircraft. These five-place aircraft, designated JRB-1, had a hatch within the cabin door to allow an oblique camera installation; they also had a fairing over the cockpit and forward cabin to allow for the radio control of drone aircraft. The fairing had numerous windows permitting the drone controller to observe and control the drone aircraft. Two other orders following bringing the total number of aircraft ordered to eleven; all were delivered by late 1940. Initially, the JRB-1s were named Voyager but the name was subsequently changed to Expeditor. The USN placed a second order in 1940 for fifteen five-passenger aircraft, designated JRB-2, intended to serve as transports for senior officers. During the war, two USAAF C-45s and a civil Model B18S, were transferred to the USN and designated JRB-2. All future Model 18s acquired by the USN would be ordered by the USAAF and transferred to the Navy. In 1942, the USAAF ordered 243 eight-passenger C-45B-BHs; included in the order were 20 for the USN which designated them JRB-3s. These aircraft were fitted with photographic survey equipment and could be used as either transports or photographic aircraft. All were delivered to the USN in 1942 and 1943. In February 1940, the Chinese government ordered six Model M18Rs from Beech. These aircraft were designed as advanced pilot trainers and light bombers and were equipped with a Plexiglas nose, a dorsal turret, internal bomb racks and a machine gun in the rear floor. Deliveries of these aircraft began in September 1940. In that same month, the USAAC placed an initial order for a bombardier trainer designated AT-11-BH. The AT-11, which evolved from the Model M18R, had a Plexiglas nose accommodating a Norden bomb sight and a flexible 30-caliber (7.62 mm) machine gun; an internal bomb bay accommodating 1,000-pounds (454 kg) of bombs; and an electrically-operated Beech and Crocker-Wheeler dorsal turret with a 30-caliber (7.62 mm) machine gun. During the war, the USAAC/USAAF ordered a total of 1,902 AT-11s which included 320 ordered for the USN in 1942; in USN service, these aircraft were designated SNB-1 Kansans and were used for bombardier training of bomber and patrol bomber crews. Deliveries to the USN began in 1942. A second specialized trainer acquired by the USAAC/USAAF was the AT-7-BH. This model, initially ordered in August 1940, could accommodate an instructor and three student navigators with each student having an individual chart table and instruments; the AT-7 also had a rotatable astrodome on the top of the fuselage just aft of the cockpit. The USAAC/USAAF ordered a total of 1,086 AT-7-BHs during the war which included 509 aircraft ordered for the USN in 1942; in USN service, these aircraft were designated SNB-2 Navigators. An advanced version of this aircraft, initially ordered by the USAAF in March 1943, was the AT-7C-BH with a higher gross weight and more complex avionics. A total of 925 AT-7Cs were ordered by the USAAF including 376 for the USN which designated them SNB-2C Navigators; deliveries began in 1943. It has been said that over 90 percent of U.S. bombardiers and navigators in World War II were trained in AT-7, AT-11 and/or SNB aircraft. During the war, a small number of SNB-2s were converted to SNB-2Hs and SNB-2Ps. The SNB-2H was an ambulance aircraft designed to carry patients to and/or between hospitals while the SNB-2P was a photographic reconnaissance version of the SNB-2. SNB-5: SNB-2s modified in 1951. These aircraft were equipped with R-985-AN-3 engines; a Heinz A-3A autopilot; heavier wing center section; a new instrument panel; new landing gear struts, wheels and brakes; and Aeroproducts constant-speed, fully-feathering propellers. SNB-5P: A number of SNB-2Ps remanufactured to the C-45G standard but retaining their camera capabilities. JRB-5: A proposed transport version of the SNB-5 that was never built. JRB-6: A number of JRB-3 and -4s that were modernized but not fully to the SNB-5 configuration; the major omission was the new main and tail landing gear. After being modified, the SNB-5s were renamed Expeditor. In 1962, the U.S. Department of Defense adopted a new, standard designation system based on the USAF system that was to be applied to all military aircraft. The SNBs still in the inventory were redesignated C-45s, specifically, the SNB-5 became TC-45J and the SNB-5P became the RC-45J. TC-45Js whose primary mission changed from training to utility transport were subsequently redesignated UC-45Js. JRB-2: Fifteen five-passenger B-18Ss powered by R-985-50 engines acquired as staff transports for senior officers. 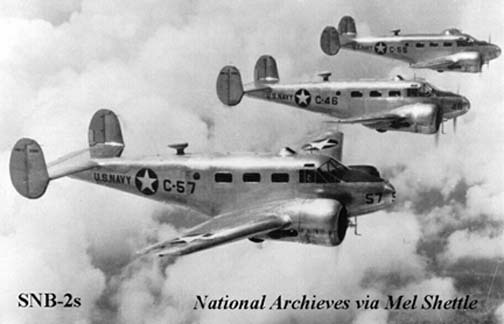 Two USAAF C-45s and one impressed Model B18S were transferred to the USN during the war. JRB-3: Twenty USAAF UC-45B-BHs for USN. Powered by two R-985-AN-1 engines, these eight-passenger transports could also be fitted with photographic survey equipment. JRB-4: 328 USAAF UC-45F-BHs for USN. Powered by two R-985-AN-1 engines, this seven passenger transport had a lengthened nose. JRB-5: Proposed transport version of SNB-5; not built. JRB-6: A number of JRB-3 and -4 aircraft modernized in the 1950s but not fully to the SNB-5 configuration. SNB-1 Kansan: 320 USAAF AT-11-BH bomber/gunnery trainers transferred to USN. Powered by R-985-AN-1 engines, these had a plexiglass nose, dorsal turret and a bomb bay. SNB-2 Navigator: 509 USAAF AT-7-BH navigational trainers transferred to USN. Powered by R-985-25 engines, these aircraft had a crew of two plus an instructor and three students. SNB-2C Navigator: 376 USAAF AT-7C-BHs identical to SNB-2 but equipped with more complex avionics and were powered by R-985-AN-3 engines. SNB-2H Navigator: Small number of SNB-2s converted to a hospital aircraft to fly patients to and/or between hospitals. SNB-2P: Small number of SNB-2s converted to photographic reconnaissance aircraft. SNB-3Q: At least one SNB-2 converted postwar to an electronic countermeasures (ECM) training aircraft. SNB-4: Designation given to 117 SNB-1s returned to the Beech factory in 1947 for rebuilding and modernization. SNB-5: SNB-2s modified in 1951 to the USAF C-45G standard. Redesignated TC-45J in 1962. SNB-5P: SNB-2Ps modified in 1951 per the SNB-5 upgrade. Redesignated RC-45J in 1962. RC-45J: SNB-5Ps redesignated in 1962. TC-45J: SNB-5s redesignated in 1962. Those whose mission was changed from training to utility transport were redesignated UC-45Js. UC-45J: TC-45Js redesignated when their mission changed from training to utility transport. The first JRB-1 was delivered to Naval Air Station (NAS) Anacostia, District of Columbia in late 1940. In December 1941, the USN had eleven JRB-1s and 15 JRB-2s in the inventory. The JRB-1s were assigned to Utility Squadron Five (VJ-5) at NAS Cape May, New Jersey (five aircraft);=A0 VJ-3 at NAS San Diego, California (four aircraft); and the Naval Aircraft Factory in Philadelphia, Pennsylvania (two aircraft). Thirteen of the 15 JRB-2s were assigned to Navy units at seven bases in the U.S. and two were assigned to the Naval Attaches in Bogota, Columbia and Lima, Peru. The JRBs were usually assigned to a naval air facility as a utility (hack) aircraft. One JRB at NAS Anacostia was provided to the British Air Commission for their use. Another major user of the JRB was the Naval Air Transport Service (NATS) which used these aircraft for instrument proficiency training and as a light transport. NATS=92 Naval Air Ferry Command (NAFC) also used the JRB as a transport to return ferry pilots to their home base after delivering aircraft. Instrument Flight Instructor School (IFIS) at NAS Atlanta, Georgia. Naval Air Navigation School (NANS) at NAS Shawnee, Oklahoma. Operational Training Unit Bombing Squadron Two Number 1 (OTU VB2 #1), the training unit for Lockheed PV Venturas, at NASs Sanford, Florida and Beaufort, South Carolina. Training Squadron Eight C of the Eighth Naval District (VN-8D8C) which provided the multi-engine syllabus at Naval Auxiliary Air Stations (NAAS) Corry Field and Whiting Field, Florida. VN-18C which provided the multi-engine syllabus at NAAS Rodd Field, Texas. The last SNB-5 was retired by the USN in July 1972. The first Model 18 operated by the USMC was the JRB-2. In December 1941, two were in the inventory, one assigned to the 1st Marine Aircraft Wing (1st MAW) at Marine Corps Air Station (MCAS) Quantico, Virginia and the second assigned to Base Air Detachment Two (BAD-2) at NAS San Diego, California. By November 1942, the Marines were operating four JRB-2s. Three of these aircraft were at NAS San Diego, California, one assigned to the Service Group, Marine Air Wings, Pacific (MAWPac) and two assigned to Headquarters Squadron, 1st MAW; the fourth aircraft was assigned to Marine Observation Squadron Two Hundred Fifty One (VMO-251) based on Espiritu Santo Island in the New Hebrides Islands. By August1943, the Marines had acquired the JRB-1, the SNB-1, and the SNB-2. The largest group of aircraft were 28 SNB-1s, 25 assigned to Marine Operational Training Squadron Eight (OTS-8), the North American PBJ Mitchell, q.v., training unit at MCAS Edenton, North Carolina and three assigned to the Base Air Detachment (BAD), MCAS Cherry Point, North Carolina. One SNB-2 was assigned to the BAD at MCAS El Toro, California. Also on the inventory were five JRBs, one each assigned to Headquarters Squadron One (HqSq 1) at NAS San Diego, California; one assigned to HqSq 2 at Munda Airfield, New Georgia Island; HqSq 15 at Marine Corps Air Base (MCAB), Kearney Mesa, San Diego, California; HqSq 24 at MCAS Ewa, Oahu, Territory of Hawaii; and MCAS Quantico, Virginia. In 1944, the Marines took delivery of JRB-3s, JRB-4s and SNB-2Cs followed by SNB-2Hs in 1945. The USCG acquired seven JRB-4s with the first being acquired in April 1943 and the seventh in July 1947. These aircraft were used primarily for administrative flights. Two of these aircraft were returned to the USN in 1948/49 and the remaining five served until 1956.